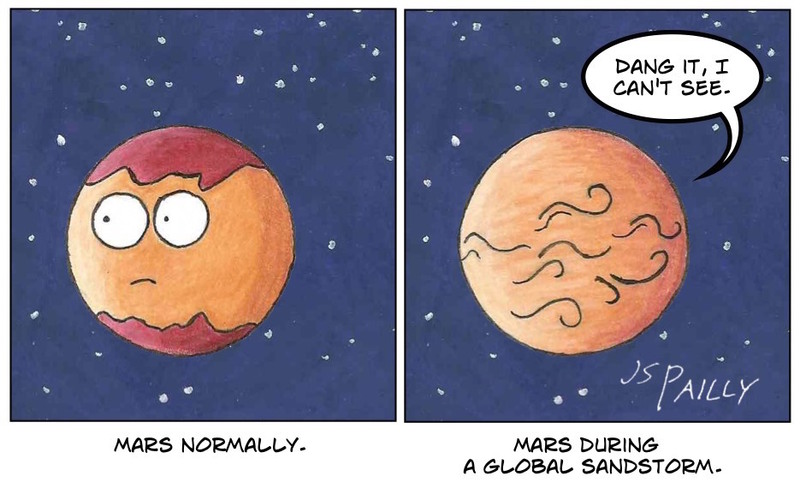 Martian Sandstorms: Just How Worried Should You Be? Before you plan your next trip to Mars, be sure to check the weather forecast. Martian sandstorms can be rather extreme, in some cases spreading over the whole planet, reducing visibility to almost zero. Totally legit Hubble images of Mars before and during a global sandstorm. However, the dangers associated with these sandstorms are sometimes exaggerated. Attempting to land during a Martian dust storm can be hazardous. In 1971, a global storm happened to occur just as a pair of Soviet landers arrived. Let’s just say things didn’t go well. But if you’re already on the surface of Mars when a dust storm begins, as quite a number of NASA landers and rovers have been, you really don’t have much to worry about. Yes, there are 60 mile per hour winds, but atmospheric pressure on Mars is less than 1% that on Earth. So while these storms have wind speeds comparable to Earth hurricanes, they are nowhere near hurricane force. Dust storm season takes place during summer in the planet’s southern hemisphere. Martian southern summer happens to coincide with Mars’s closest approach to the Sun, making it warmer than northern summer. This extra heat releases extra volatiles (mostly CO2 gas) from the south polar ice cap. This agitates the atmosphere, which in turn whips up some spectacular sandstorms. So if you’re planning a vacation on Mars, try to avoid landing during southern summer. Since you can only schedule your trip for times when Earth and Mars line up properly, this greatly reduces the number of possible launch windows. But trust me: crash landing on Mars during a sandstorm could really spoil your trip. What are the Risks of Dust and Sand on Mars? from Mars One. Spacecraft Monitoring Martian Dust Storm from NASA. Today’s post is part of Mars month for the 2015 Mission to the Solar System. Click here to learn more about this series. Posted by J.S. Pailly on June 24, 2015 in Mars (2015 Mission), Mission to the Solar System. I’ll make sure to bring my utility belt and run a planetwide short range scan before disembarking the shuttlecraft. You just never know do you? Hey don’t open that door!!! Is there air??? You don’t know! Of course this being Mars – Carbon dioxide is in ample supply here. Its just a shame we’re not robust Martians. Good plan. Be sure to check for life signs too. Interesting stuff – reminds me a little of learning about the planets for the first time when I was a kid. ^_^ I think it’s been nearly that long since I considered going to Mars on vacation as well. I’m glad you learned something. Hopefully I’ll see you sometime at the hotel! Crash landing on Mars at any time seems like a bad option. Have you read Andy Weir’s ‘The Martian’? I downloaded it this week and hope to read it sometime in the next month or so. It’s about an astronaut who gets stranded on Mars and has to improvise constantly to survive. It’s getting a lot of rave reviews. It’s high on my list. I want to make sure I read it before the movie comes out.